Note: Competitors participating in Quarter Split or Standing Block Chop are not eligible for this event. Corral must a safe distance from spectators and only competing athletes, event judge and timer are permitted inside. Two (2) team members must each cut through their own horizontally supported cant. Chains, spikes or stantion may be used in supporting the cant. No team members may assist in supporting the can. 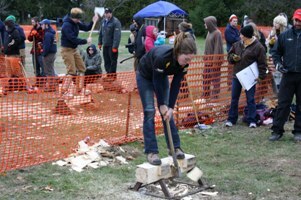 The first competitor only, must have their axe on top of the wood to start the event. If the competitor falls off the log, they may not resume chopping until they are back in the footholds. No chopping if falling off the log. All chopping must be between footholds. If a competitor chops into the footholds, a thirty (30) second penalty will result. Upon completion of the event, incomplete chops will result in a DQ. Slabbing rule is in effect. Competitors must try to avoid slabbing by spiking chopping faces. Three (3) spikes/nails (3in / 7.62cm) are provided by competitor. If slabbing occurs, the event will continue unless nails are not used. DQ will result. If inappropriate dress is worn by the competitor, the judge will not permit the event to start. Competitors are not permitted to touch the log until the judge makes their decision. If done, DQ will result.